Over the past several years the news media has been full of stories about spending cuts and their impact on employment and services. Cuts continue in some sectors despite an increasingly healthier growing economy with headlines still highlighting job cut threats – many in administrative, support and back office functions. From new government announcements it is clear that cuts are continuing to lead directly and indirectly to reduction in office requirements across the public sector. While expectations are that the private sector will act as the growth engine taking up public sector slack, in practice the impact on private sector office requirements still remains with companies striving to drive out waste and inefficiencies to remain cost competitive. Many organisations both public and private are progressing and refining programmes of office rationalisation and consolidation focussed on vacation for disposal and particularly lease termination activity. In the local authority sector Birmingham City Council have progressed a 35% reduction in its 1 million sq ft back office estate and Somerset County Council are progressing plans to vacate 40% of its office space. But the pace and quantity of offloading is expected to remain over the next 2 years as austerity bites deeper and forces change beyond traditional ways and existing organisational boundaries. Indeed, the Government One Public Estate initiative is designed to merge accommodation requirements across the public sector and release considerable amounts of space. The initial phase of this initiative alone is expected to save £21m in running costs and create £88m in capital receipts, generate around £40m for local economies and create an estimated 5,500 jobs and 7,500 homes over five years. Things looked rosy, backed by the credit driven boom and Public Sector growth in the years up to 2008 and although office property markets and values are now well on the road to recovery, the recession has significantly altered views of the office asset. Indeed in these challenging times large parts of corporate office estates have increasingly been viewed as underutilised, inflexible carbon inefficient liabilities that are a drag on rapidly changing organisational needs and business effectiveness. This means organisations must continue to review and re-assess office strategies made in easier market conditions and now rapidly re-focus activity to the new harsher realities. Organisations can no longer afford long gestation periods and talk without action as they find themselves in the position of having to deliver a great deal more with a great deal less in a short timeframe. Almost without exception, organisations are following similar paths in driving their office plans even harder to meet growing demands for greater savings and to make up for the diminished receipts, and (in the public sector) inflexible PFI commitments. Not only do these plans need to take out existing surpluses and poor performing properties but they must also take account of the need to accommodate fewer people in more effective ways. 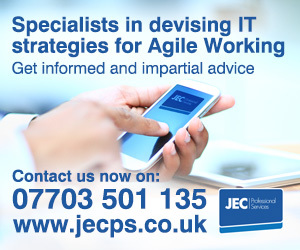 Organisations have been and continue to rationalise their people numbers, but there is also now the long needed driver to focus on new and more efficient and effective ways of working – sharing, outsourcing and particularly wider implementation of agile and distributed working. These plans must now provide the groundwork to support the leaner, more agile and virtual productive workforces that will be essential to take advantage of opportunities when better times do appear. There has been significant investment in new technology, infrastructure and workplaces over the last decade. However, the full benefits of this investment have rarely been claimed due to political inertia, poor management and a lack of business drivers in a profligate booming economy. The current “climate” now provides the environment to dismantle these barriers to transforming work, enabling the creation of more capable agile workforces and seizing the full opportunities from past investment – not in the previous piecemeal approach of pockets and pilots, but across estates, businesses indeed whole sectors. A Capita Symonds survey confirmed that 80% of Councils are considering co-locating with other public bodies as a way of saving public property costs. Although limited progress has been made with “Total Place” it has the long term aim of significant rationalisation through sharing space and resources across all government-funded organisations. In addition to sharing, the public sector must utilise their “operational” estate to support distributed and remote working – using existing neighbourhood offices, libraries, housing centres, depots as touchdown offices, as well as “third places” – all of which diminish and change the overall central office requirement. The rising number of serviced office providers and co-working hubs are introducing a new variety of office “space products” while also adding a new agile dimension to the office tenure model. These products offer Corporate and SME occupiers flexible time and space on “pay as you go” contracts. Indeed many project and “road warrior” based organisations have for some time used Regus services to source their “flexwork” and short term indeterminant requirements through flexibility in tenure commitment with the opportunity to quickly fold or expand. In the case of Yell UK, the Regus Business World product enabled Yell to vacate its 35 Sales Team offices around the UK taking advantage of the network of Regus business lounge facilities (over 150 sites) reducing Yell operating costs to a fraction of their original fixed base operations as well giving a more effective and productive working experience for the Sales Teams. Many previously reluctant organisations are now being forced to seek significant property and related savings as well as service improvements through new ways of working and development of agile working programmes. The majority currently seem satisfied with agility ratios of 70 to 80% (desk share of around 10 people to 7 or 8 workstations), but Monmouthshire County Council points the way for more ambitious opportunity having already delivered a 50% agility ratio (2 people to 1 workstation) they now have plans to achieve 30% across its office estate by 2015. Due mainly to culture and management inertia home working (other than “ad hoc” working) has to date had limited application in all but a few organisation. A number of private sector examples exist in the Telcos and Management Consultancy sector and the best example in the public sector is Ofsted where over 50% of the organisation is home-based. Workstyle analysis is important to establish suitability of work and individuals for remote working, but the ability to use home as a workplace regularly or occasionally for large elements of the workforce is a key aspect in the most progressive and successful agile working programmes. Some early adopters of remote working in the US, notably Yahoo and HP have recently reversed their home working policy in favour of campus collaborative facetime. While this offers some ray of sunshine for the office it is not yet certain whether this policy is temporary based on short term business and cultural re-alignment, or a more permanent change for these companies or this sector. However, less well endowed organisations with thin sliced budgets are being forced to reappraise the savings and benefit opportunities of wider introduction of some form of homeworking – not just for property savings but also for productivity and service improvement. The mature BT Agile Working model shows what can be achieved, where some 15% of its workforce (including some call centre staff) are registered home workers, and a further 70% are remote and homework enabled. BT has seen more than 50% reduction in its office estate over the last decade, with accommodation savings from Homeworking alone amounting to over £100 million pa. Additionally evidence suggest that home enabled employees are 20 per cent more productive than office-based colleagues and have 50 per cent lower carbon footprints. The Office is certainly not dead but its function is changing as technology enables and competitive financial pressure demands re-definition of work and the workplace. Indeed as Jacobina Plummer Agile Working Programme lead at Unilever said “the purpose of today’s office is to bring people together in spaces designed around activity with the emphasis on collaboration and the absence of assigned desks” and this can lead to the “rebirth of the office rather than its protracted death.” Nevertheless, the overall result of cost cutting, sharing, outsourcing and transformational activity is that many organisations will be, and are implementing plans to reduce their office requirements by 50% or more. So what will happen to all this vacated office space? Clearly the logic of large quantities coming onto an unreceptive market is that there will be a massive oversupply. Yet nearly every organisation appears to be focused on feeding this oversupply. Where will demand for office space come from ? The problem exists for Landlords but it also impacts Tenant Occupiers with long leases. However, it definitely seems like bad news for many Landlords. Ian Ellis of Telereal Trillium confirmed at Public Property UK, “In the life of this parliament, we’ll end up with 4m sq ft of empty space to deal with. These are 1960s and 1970s secondary properties in provincial towns. In the past, we’ve been able to let these to quangos or councils. The culture has been one of: the government will renew because it always renews. Most bodies have expanded rather than shrunk. That is no longer the case. There is more surplus coming to the market, and there is shrinking demand from the public sector overall”. The recent IPD Lease Events Review confirms a tenant led trend for much shorter lease terms, with 80% of UK leases signed in the year to June 2013 were for less than 5 year terms. It also revealed that 60% of expiring leases fell vacant for 3 months or longer, while only 32% renewed at the end of their lease overall, and more worryingly only 8% re-let after the previous tenant vacated. Perhaps the worse news for Landlords and Investors is that less than 6% of leases signed last year were over 10 years in length, compared with twice that only 5 years ago and over 20% 10 years ago. Demand for existing offices will remain, helped by lower values and tenant friendly deals, but at a considerably reduced level for some years to come. Speculative development will be limited, although there will be opportunities particularly in the best locations and for better quality space as organisations merge, consolidate and upgrade to newer more carbon efficient space. The reality for older space particularly in poorer locations and regions is that it will remain unattractive and some will simply become long term obsolescent liabilities. Alternative use may be the best focus for some of these properties, and government re-alignment of planning guides are encouraging this, spawning a number of examples of redevelopment for residential, hotel or educational use, although some may simply become car parks! It will be interesting to monitor the developing impact of new international accounting standards on property holdings but the bigger challenge for the office market is more stringent carbon regulation and its impact on the value and demand for different classes of office property. As John Pike of 40% Symposium asserts “there is a clear correlation between the demand for sustainable buildings and commercial reality enabling landlords to choose who they let and sell to”. Clearly there is increasing focus for Landlords, Developers, Investors and Occupiers on sustainability as a key element in asset value and tenant demand. A Survey of the FTSE 350 by Legacy Portfolio indicated that while 66% of Companies anticipate revenue growth, 59% anticipate keeping headcount the same but 75% indicate their UK property portfolio will remain unchanged. This suggests there is capacity within corporate occupiers’ property portfolios to accommodate business expansion and headcount increases. The conclusion is that demand for new space will therefore continue to be limited. Indeed this survey confirms the view that as economic fortunes improve it is still likely that global competitive pressures, new technology and new agile ways of working will focus attention on “spaceless growth” and more sustainable agile property strategies that require different types of space, procurement methods and tenure arrangements that will diminish the need for office space. So who will need offices and what will they look like? Let me know your thoughts…..
What to do with those obsolete offices ? LSH recent research reports that 11,500 new homes could be created by converting 7.4m sq ft of the UK’s obsolete office stock. The research analysed 32 regional markets and found that 27% of total regional availability is obsolete (11.7m sq ft) and of this stock 7.4m sq ft is suitable for conversion, wth Birmingham topping the table for obsolete office space. New planning rules will allow developers to convert office buildings into blocks of flats without asking councils for permission under radical changes to the English planning system designed to speed up the delivery of new homes.